Adrian has produced 39 documentaries, all of which have been shown all over the world and in the UK; many shown on Sky, ITV and The History Channel. Princess Diana: In Search of Happiness was bought by Life Magazine, Sky, RAI, RTL, Channel Seven and television stations throughout the world and achieved official obituary status. The programmes have often achieved Top 10 ratings when shown. Adrian wrote the Arts Council documentary How Does It Feel? whose participants included Sir Michael Tippett and David Hockney. Adrian was the Executive Producer of Channel Four and ZDF’s feature Zina, starring Ian McKellen and Domiziana Graziosi and Channel Four’s Every Picture Tells a Story, starring Phyllis Logan. Both had UK theatrical releases, Channel 4 showings and releases throughout the world. Adrian founded, schedules and acquires all films and series for the True Movies group of five channels. The annual audience reach is of over eight million. True Movies was the most successful film channel ever launched by SKY. Now broadcasting in sub-Saharan and South Africa as well as the UK and the Republic of Ireland. In 1982 Adrian Munsey founded Odyssey Video, a leading UK distributor of feature film true stories. Since 1982, Odyssey Video released over 500 titles, including a number theatrically with a royal premiere, and has regularly been in the UK video Top 50. In one notable year Odyssey Video had more titles in the UK rental video chart than any other company except Columbia Tri-Star. Odyssey Video represented Barbara Taylor Bradford exclusively on video in the UK as well as releasing a number of other bestselling authors including Joanna Trollope, Mary Wesley, Rosamunde Pilcher, Jackie Collins and Danielle Steel. In addition many classic film titles were released including The First of the Few, Where Angels Fear to Tread, Tommy, Beyond a Reasonable Doubt, Julia and Drums Along the Mohawk. A key relationship was developed with Merchant Ivory and over 20 Merchant Ivory films were restored and released, including Howards End and Maurice. William, Kate & George: A New Royal Family is currently a co-production with BBC Worldwide. In development with They, the story of Rudyard Kipling’s loss of two of his three children. In pre-production of a major new film based on the work of one of Britain’s best known 20th century novelists. Watch now on Freeview, Freesat, Sky and Virgin digital TV packages. …First Do No Harm starring Meryl Streep – Adrian’s Favourite True Story. Listen to all of Adrian's music now online. For feature film Oxi, written and directed by Ken McMullen. 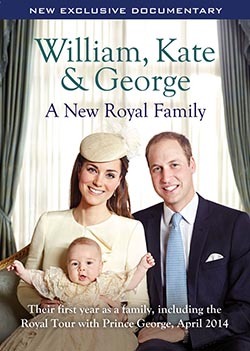 Latest documentary, William, Kate and George available now. New Album - Change of Heart Out Now. The Clintons' personal and political lives with contributions from many who know them.